It's a sobering fact. 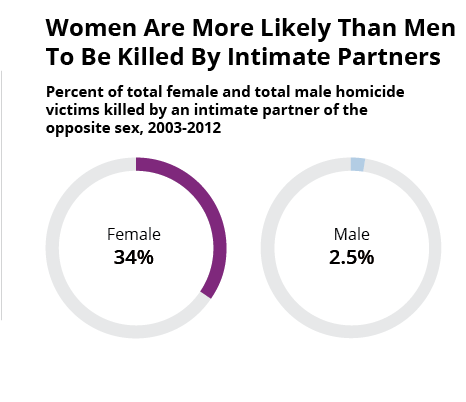 At least one third of all female homicide victims in the U.S. are killed by male intimate partners -- husbands and ex-husbands, boyfriends and estranged lovers. 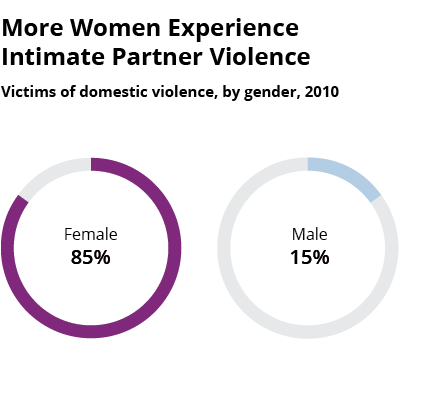 While both men and women experience domestic violence, the graphics below should put to rest the myth that abuse occurs equally to both sexes. 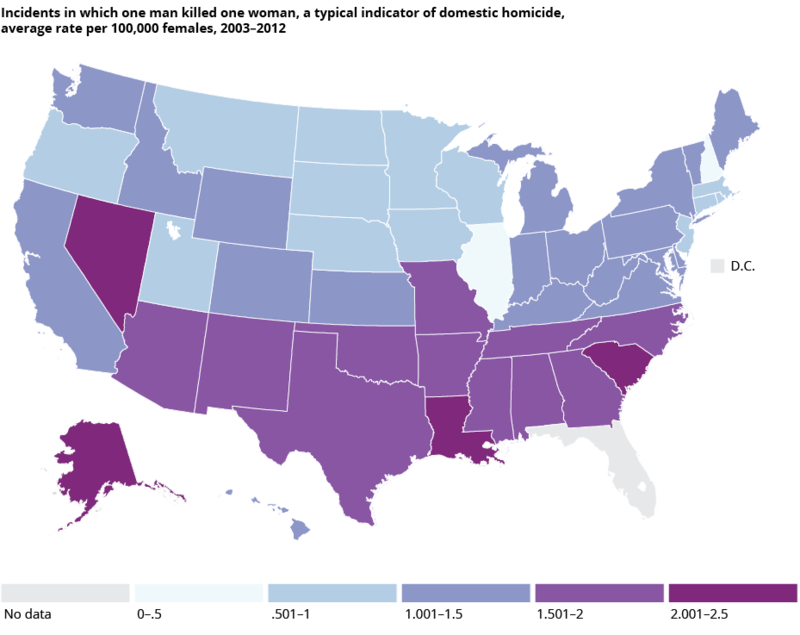 The States Where Women Are Most Likely to Be Killed By Men Every year, the Violence Policy Center tracks which states have the highest rate of incidents in which one man kills one woman, a typical indicator of domestic homicide. The Huffington Post crunched the data to find the worst offenders over the past decade. 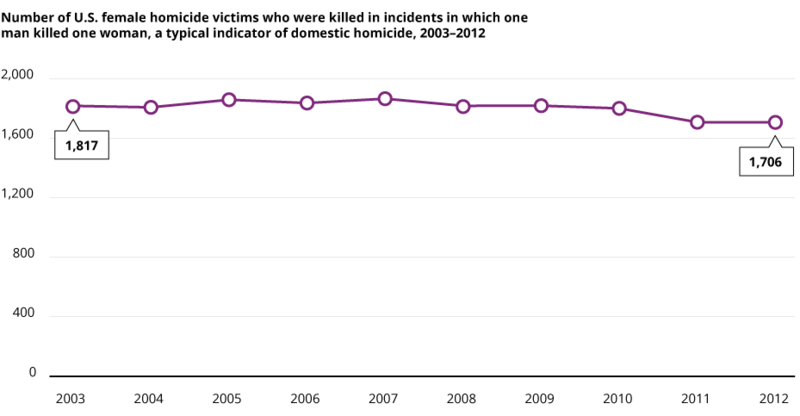 Between 2003 and 2012, Nevada had the highest rate, at 2.447 women killed per 100,000. In 2012, however, the most recent year for which data is available, Nevada's rate dropped to 1.83, and Alaska took the top spot with 2.57 women killed per 100,000. Over 18,000 Women Were Killed By Men Since 2003 Since the landmark Violence Against Women Act was passed in 1994, annual rates of domestic violence have plummeted by 64 percent. But still today, an average of three women are killed every day. More often than not, women are shot. Over half of all women killed by intimate partners between 2001 to 2012 were killed using a gun. Note: In 2012, as in years past, the state of Florida did not submit any data to the FBI Supplementary Homicide Report. In 2012 and 2011, data from Alabama was not available from the FBI. Data from Florida and Alabama was not requested individually because the difference in collection techniques would create a bias in the study results. In addition, according to the FBI’s Uniform Crime Reports, limited SHR data was received from Illinois for 2009-2012. Sources: Violence Policy Center, Bureau of Justice Statistics, National Institute of Justice, Center for American Progress Infographic by Alissa Scheller for The Huffington Post.